Charge your phone while walking or dancing with your boots & shoes! Charge your phone with these boots & shoes! Not really solar powered, I admit… but hey, heat is heat. If it comes from the sun or from your feet! Summertime: not only the season for festivals, it also has become the time for a yearly exhibition of new, innovative and green-minded initiatives. These boots are made for chargin’, and that’s just what they’ll do! 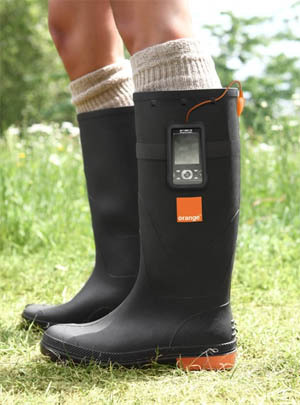 Meet the Orange Power Wellies: use the heat from your feet to keep your mobile devices up and running. So run Forrest. Run! Because everything we do generates power: about 70 watts per step, 1 watt per breath! Together with GotWind, Orange created these Power Wellies to target festival-goers with an electricity-generating boot which turns heat from your feet into a current that can be used to charge for example a mobile phone. 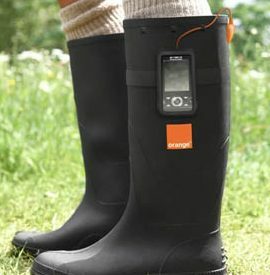 Only twelve hours of romping at the festival in these thermoelectric wellies will provide enough juice to charge a mobile phone for… one hour! So head over to the dance tent for hotter feet to get that so needed extra charge. At the end of an exhausting day, wearers simply connect their device into the ‘power outlet’ for charging. Read more about these boots on Time.com. To increase the length of time you can charge your phone for, simply run to the dance tent and dance until you drop because the hotter your feet get, the more energy you produce. Not only Orange, also Argentine designer Soledad Martin came up with the idea of charging devices while in motion. Orange makes use of heat, Martin makes use of kinetic movement with some kind of nano or micro generator to charge cellphone batteries. Kinetic energy is basically transforming movement into electricity. You can attach the charger she made to your shoe and just do whatever you do, as long it involves you moving. Sports, skateboarding, a walk with your dog (maybe attach it to your dog! ), the charger will juice op the battery attached to it. So how does this work? Just like those automatic watches, but then on a bigger scale. 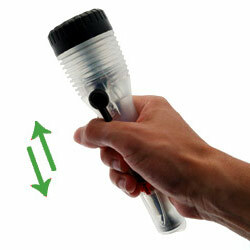 Let me explain this with this shaker flashlight. If you shake this flashlight (Faraday’s Principle), a magnet will move up and down through a coil of wire, setting elektrons in motion. Much like a dynamo does but without the turning part. So after it generates electricity you can either use it directly or store it in a rechargeable battery or in this case a capacitor. If you tie a shaker flashlight to your leg, you can charge it while walking, skating or running in exactly the same way Soledad Martins charger works. 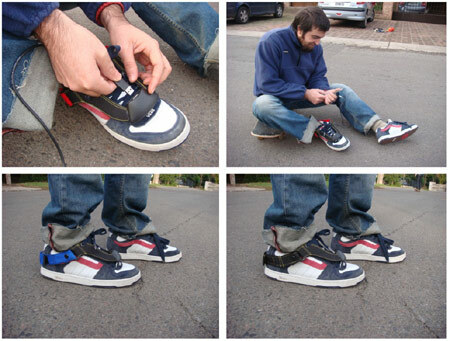 Talking about tying charging things to your leg or shoe, the nPower PEG works in a similar way. 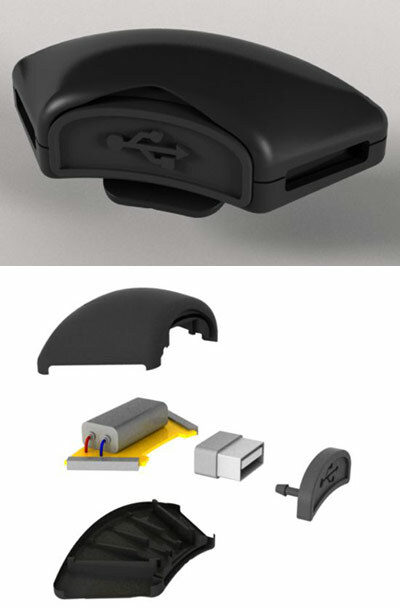 This hybrid charging device, which you can put in your bag or tie to your leg, charges energy to an internal battery (5V DC, 500mA) and gives you 2.5 watts of energy to give you power when the batteries of your mobile stuff are low. 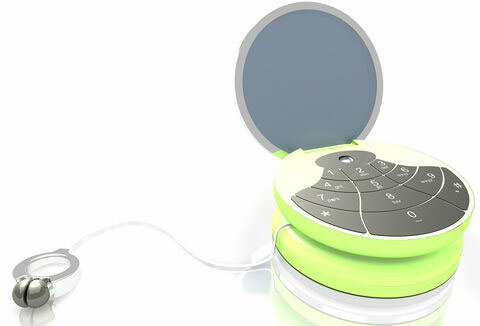 There are many kinetic chargers, even in the form of yoyo’s. You can guess how you would charge this. Great gadget! There are some people trying to make their own homemade phone charger. Take a look at this DIY kinetic hand phone charger page to find more about how to make a kinetic charger yourself. Or here for a diy solar charger. If you’re more interested in cycling, visit this page about DIY charging USB devices with your bike. Nokia has developed an interesting bicycle charging kit. If you’re interested in this, take a look at Amazon or eBay.